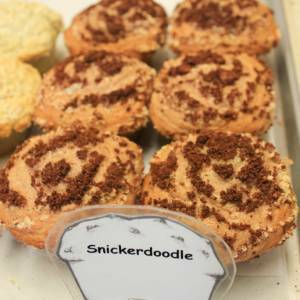 Snickerdoodlesnickerdoodlesnickerdoodle – say that three times fast! Or just get a snickerdoodle muffin and munch three of those fast. Your pick. We hope you’ll choose the second because Frank has taken the liberty of synthesizing the world famous cookie into a delicately balanced muffin mix that emulates every aspect of the famous baked snack while providing all the pros of the muffin. Here’s a muffin for everyday and every occasion. Located just south of the round-about entering Anacortes, The Store is a great place to find great baked goods, freshly roasted coffee, & a fine selection of wine!